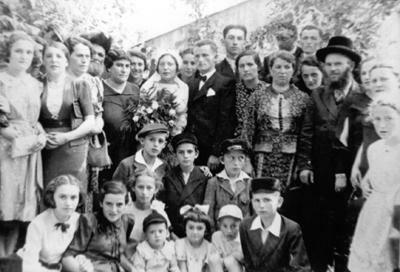 Holocaust Survivors: Photo Gallery - "Galler Wedding, 1939"
Eva Galler's half-brother, Morris, married Dora, then living in the United States, who returned to Poland to find a suitable husband. The couple left Poland just before the outbreak of war. Left to right standing: Eva, then 15, is at the extreme left. Skip two, then her father Israel and mother Ita Vogel. Skip one, Dora in veil with Morris. Then Eva's half-brother Hirsh. Skip to Eva's Uncle Abraham Vogel in hat at right. Left to right seated: a niece, then sister Hannah. Sitting in front: brother Azrael, sister Devorah in bow, then two cousins. Seated in back: a nephew and niece, then brothers Pinchas and Berele.